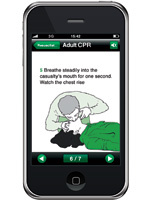 St John Ambulance has announced its first aid iPhone app is now free to download. The app which gives users advice on how to treat a range of emergencies, as well as minor injuries, has proven to be the difference between life and death. Launched last year, the ‘St John Ambulance First Aid’ app became an instant success and was the UK’s best selling health and fitness app. It has now been downloaded by nearly 43,000 people – and the charity has learnt that it has already saved a life, when a mother got in touch to say she was able to give first aid to her choking baby, thanks to the app. As winter approaches, the app gives useful advice on how to deal with effects of the cold, such as hypothermia and frostbite. It also demonstrates how to cope with emergencies such as choking or heart attacks. The charity is urging iPhone users to download the app so they have the first aid information they need to save a life or provide support while waiting for help to arrive, particularly important during winter months when ambulance waiting times may be longer. With easily accessible step-by-step information, an intuitive interface and voice prompts for several first aid techniques, the free app is something every iPhone, iPod touch or iPad user should have. Sue Killen, CEO, St John Ambulance, said: "We' like to thank the thousands of people who have already downloaded the app and made it possible for us to now make it free. I hope that even more people will download it now. Up to 150,000 people die in situations where first aid could have given them the chance to live and we are determined to change this. Being armed with the app could help you be the difference between a life lost and a life saved." The app is now free to download from the Apple App Store and the charity hopes to develop a multiplatform app in 2012. For further information about St John Ambulance’s first aid and health and safety courses in the North West call 0844 770 4800 or visit sja.org.uk/training Chamber of Commerce members are entitled to a 10% discount off all St John Ambulance’s business courses in the North West (terms and conditions apply).